Located in Lang Co which is famous for its magnificent natural landscapes surrounded by mountains and the boundless blue sea with waves coming to the immaculate and fine sand. Between the mountains and the sea is the mysterious Lap An lagoon with abundant resource of seafood. 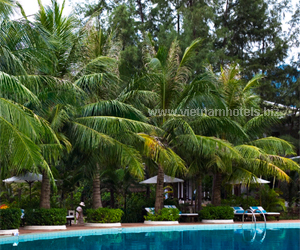 Lang Co Beach resort is 20 km from Danang International Airport and 50 km from Phu Bai - Hue Airport. It is on National route 1A with a railway crossing. extension, Minibar, Air-conditional, hair dryer, In-room safe, 24-hour room service. The Lang Co Restaurant is specialized to serve royal dishes of Hue, and its skillful employees wearing clothes following imperial Hue courts accommodating up to 300 eaters. BAR: Overlooking the Huong River and the overall city view, offering Vietnamese, French and Chinese dishes. Basement BAR: Rightly on the Huong river bank serving tasty food and beverage as well as good snack with a wide selection of drinks.